The Turret Servo Controller allows a normal servo to move up to 160 degrees (end points fully adjustable). In operation you can move the servo arm to a given point and it will stay there. The unit also has a in-built servo slow to make movement more realistic. This unit is ideal for model boats or model tanks. The Turret Servo Controller has been designed to allow a normal servo move to up 160 degrees (end points fully adjustable), in operation you can move the servo arm to a give point and it will stay there. You just move the channel stick to the left or right and return it to centre when the servo arm is where you would like it to stop. The unit also has an in built servo slow to make movement more realistic. This unit is ideal for model boats or model tanks. Plug the flying lead on the Digital Turret Controller into the selected channel on your receiver. 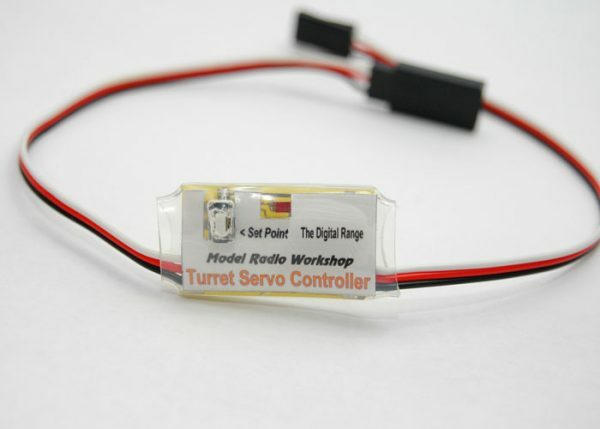 Connect the servo to the Digital Turret Controller. Switch on the transmitter and then the receiver. With the transmitter stick at neutral, the servo does not move. Movement of the transmitter stick to one side of neutral will cause the servo to move in one direction. The movement will stop if the stick is returned to neutral. Movement of the stick in the opposite direction will cause the servo the move in the opposite direction. In this way, the servo can be positioned anywhere within its travel range. All servos vary and because of the expanded travel the servo may be driven against its stops. Do not leave the servo driving against its stop or damage to the servo may result. The maximum travel positions and the speed of transit can be adjusted by performing the set-up procedure. Use the servo reversing facility of your transmitter to reverse the travel direction. Use the stick to position the servo at the required stop point on one side of neutral and press the set key until the LED lights to indicate that the stop position has been stored. Use the stick to position the servo at the required stop point on the other side of neutral and press the set key as before. The servo will not move past the positions set. 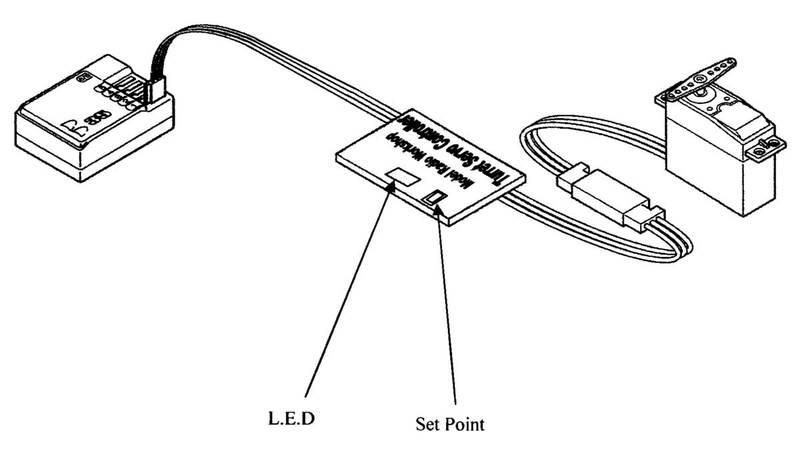 To clear the stop points, position the servo at neutral and press the set key until the LED lights. Press and hold the set key while switching on. The LED will flash in groups of four and then pause. Each flash represents a unit of transit time. One flash for one unit, two flashes for two units up to the maximum. The transit time is approximately six seconds for each flash and the servo will move more slowly as the delay units are increased. When the required number of flashes have been seen, release the key. The servo will operate at the selected speed. It is not necessary to reset the stop points when altering the transit time. The unit remembers the settings and it is only necessary to store the settings initially and when making adjustments. The servo settings can be adjusted at any time by repeating the set-up procedure.